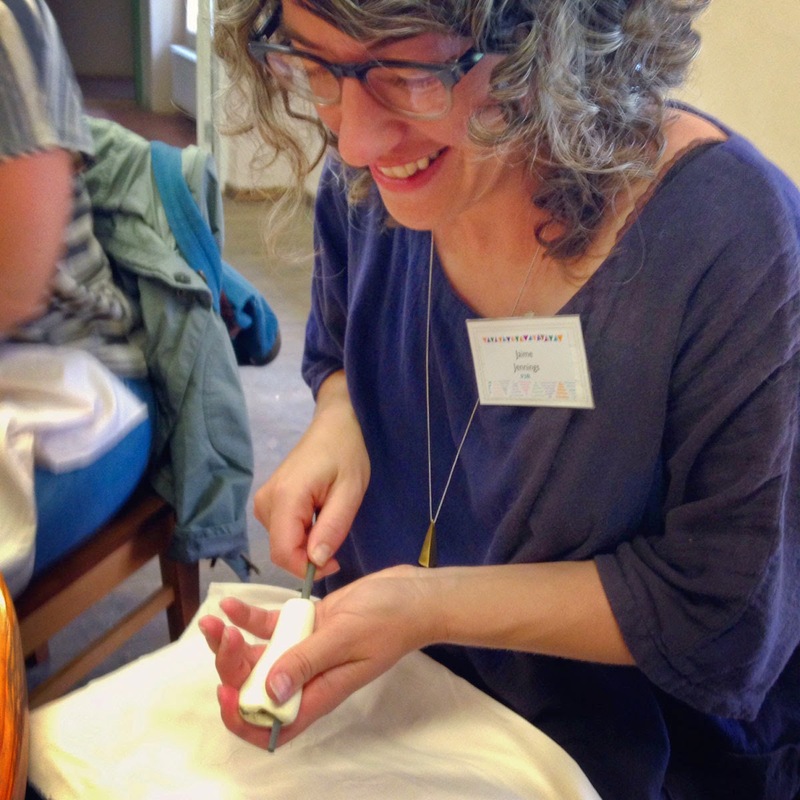 In addition to knitting, we were able to take other traditional crafts at craft camp such as ribbon plaiting, bone crafting, and ceramics. We are now really well-rounded crafters. 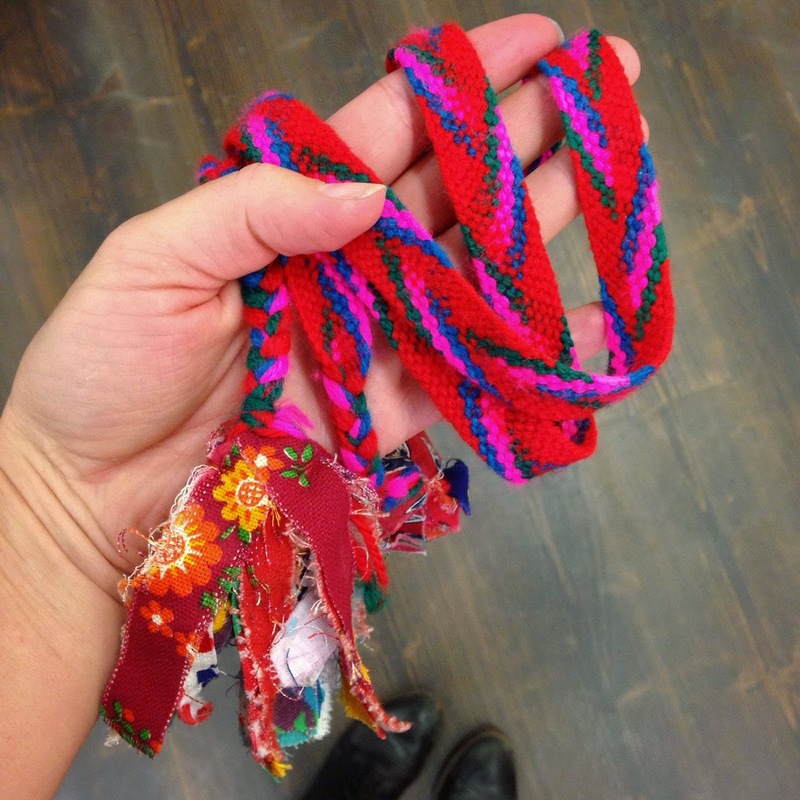 In Estonia, many of the traditional clothes are decorated with beautiful, hand woven ribbons. 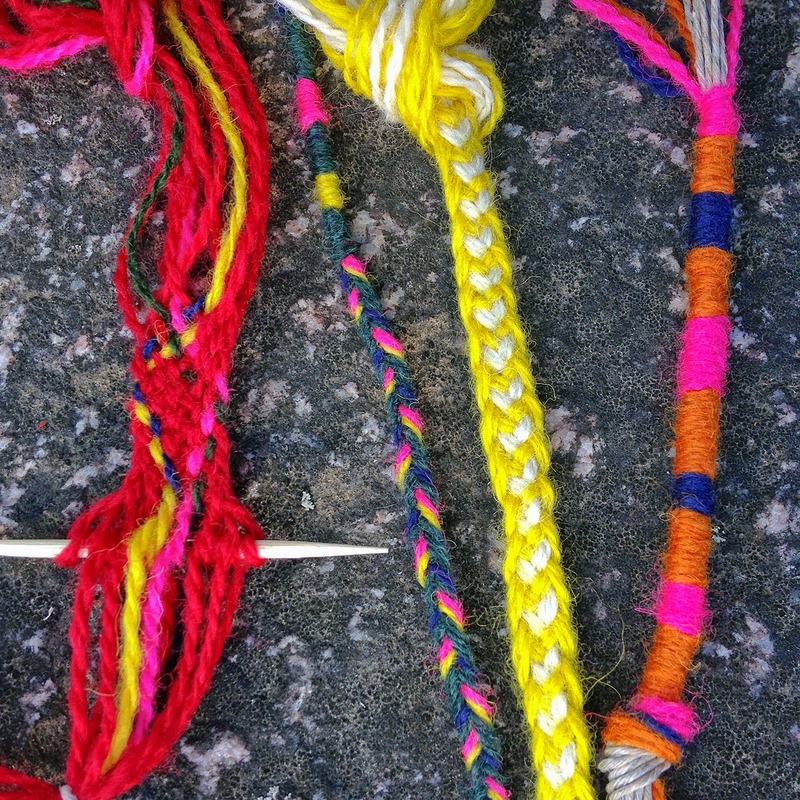 These are made from the same wool yarn that the knitting is done with and thus incorporate many of the same colors. I was able to take a ribbon plaiting class and learn some of the techniques from talented ribbon plaiting instructors, Mari and Helve. We started easy and then worked on harder and harder ribbons as class progressed. I started out feeling pretty confident, but soon realized the amount of detail and work that goes into these. Basically you are creating plain weave or twill weave patterns by hand - without the aid of a shuttle or needle. It is slow going and you have to make sure your many pieces of yarn aren't getting tangled. My biggest ribbon was only about 1/2" wide and 15 pieces of yarn across, so you can imagine what goes into the large plaited belts that can be up to 3" wide! This piece took me about 3 hours and is only 10" long. I gained a ton of respect for all the trims and belts that decorate many of the textiles works in Estonia. In high school I dabbled in ceramics, and I couldn't wait for the opportunity to try my hand at this craft again. 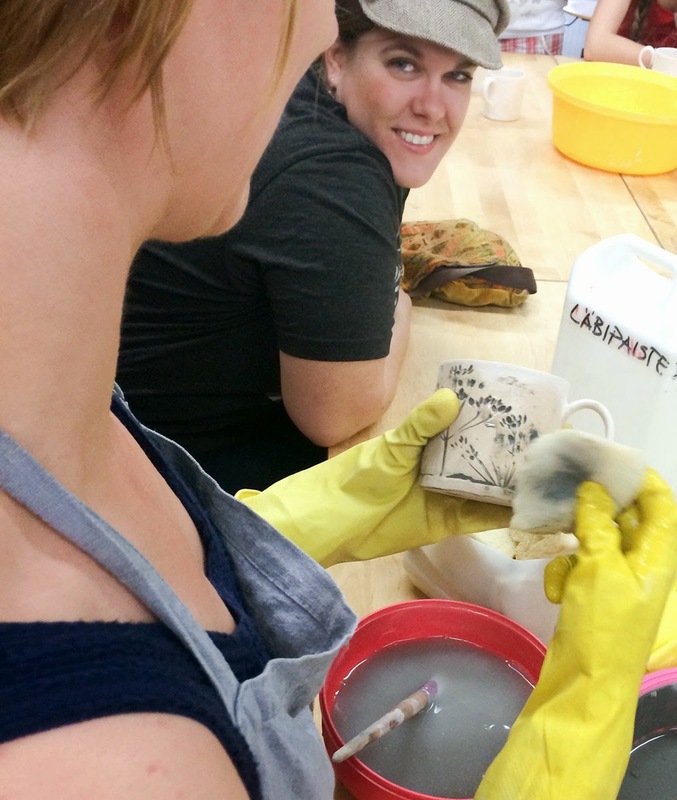 I was intrigued by instructor, Kaie's, style of decorating the slab pottery with plants and herbs. 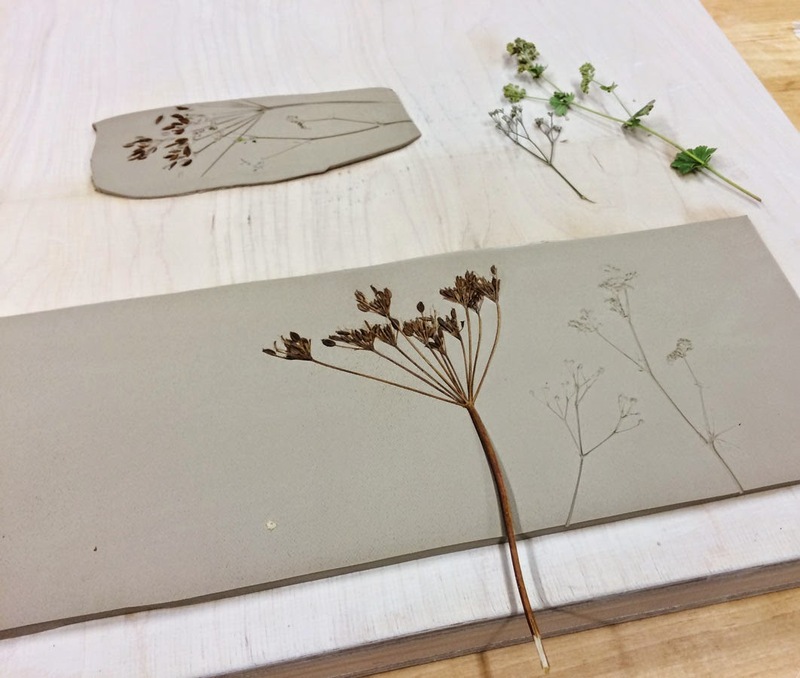 By pressing our collected plants into the wet clay, and then filling the resulting impression with dark glaze, a print of the plant appears. I enjoyed going outside and finding some of my favorite, familiar wild plants growing so far from home. Shepherd's purse, clover, and yarrow were all abundant outside the pottery classroom and so I gathered them for my plant impressions. I also used a few strange Estonian plants I'd never seen before. 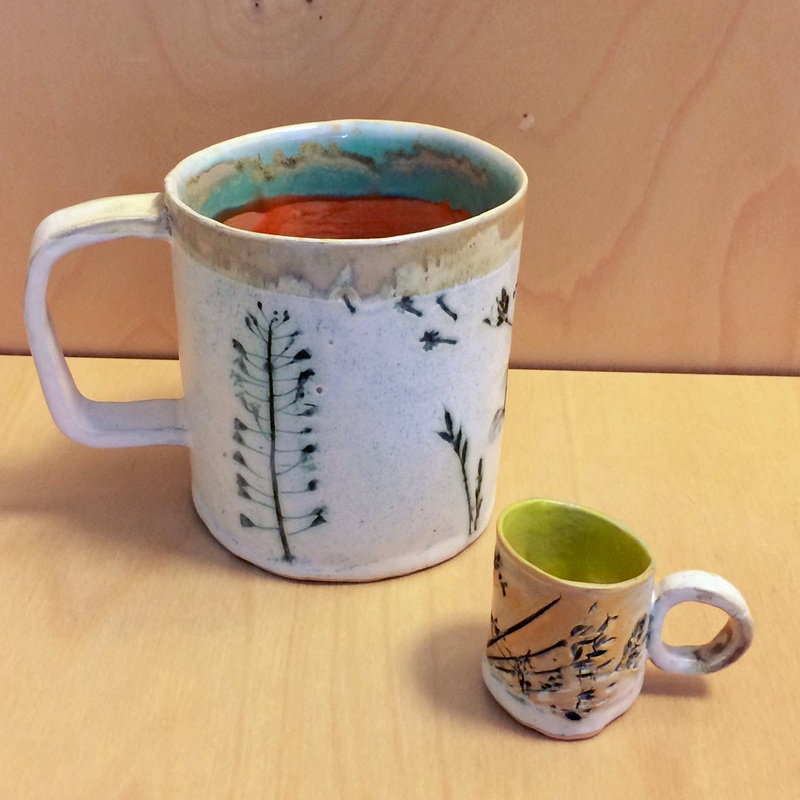 After I made my large coffee mug I couldn't resist making a tiny mug , perfect for a little sip of whiskey! Jaime and I both signed up for bone carving class. 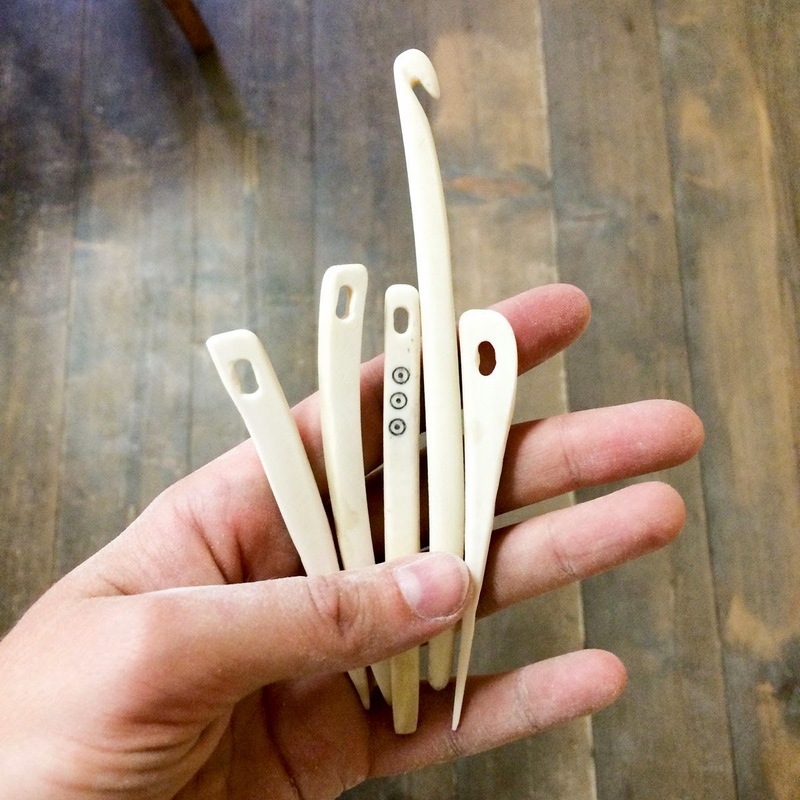 What better place to learn the craft of bone carving than Estonia? 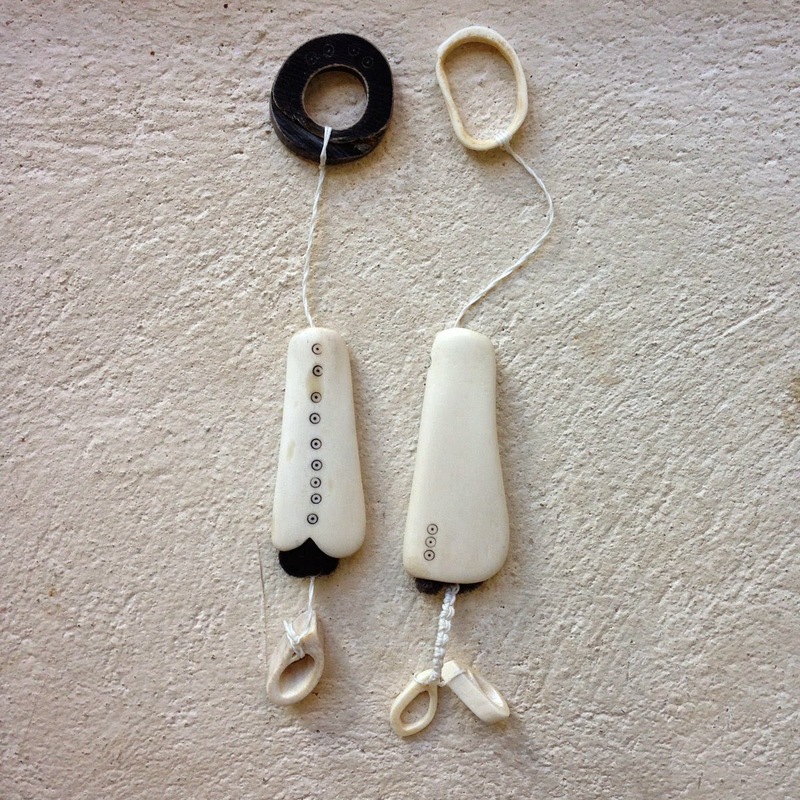 Jaime and I both started by making a traditional needle case made by smoothing and decorating a hollow jaw bone. 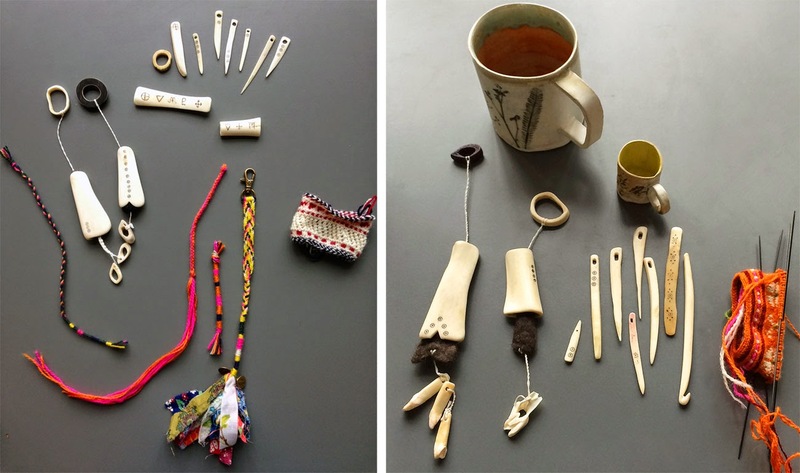 Inside, a piece of felt holds your sharp needles, and is attached to two pulls made of bone or teeth. To decorate our bone objects, we carved designs into the smoothed surface. The circles are created with a special double pointed drill bit that Monika painstakingly adapts herself. To darken the bone etchings, beeswax is mixed with wood ash, softened with your hands and pressed into the carved design. You then scrape it gently off the surface so that it remains embeded in your design. Next, I wanted to make myself a crochet hook. This was the most difficult object I carved. Monika brought out special bone just for this purpose. She explained that you want to use a type of bone that is less brittle. 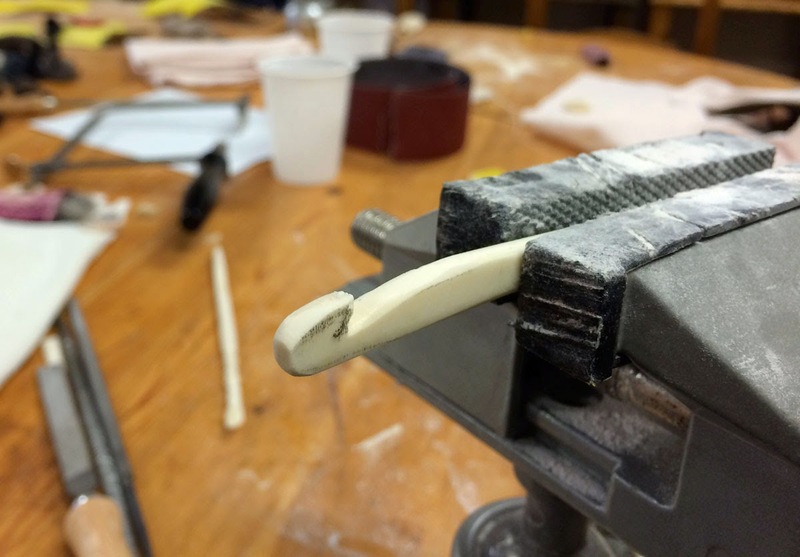 We used a hand saw to slice off a rough, long rectangle from a larger piece of bone, then sanded it until it was even and starting to get rounded. Monika roughed out the shape of the hook in pencil and I used a file to slowly hollow out the hook. Finally, more sanding rounded everything out. It was a labor of love, but I adore my new handmade crochet hook. 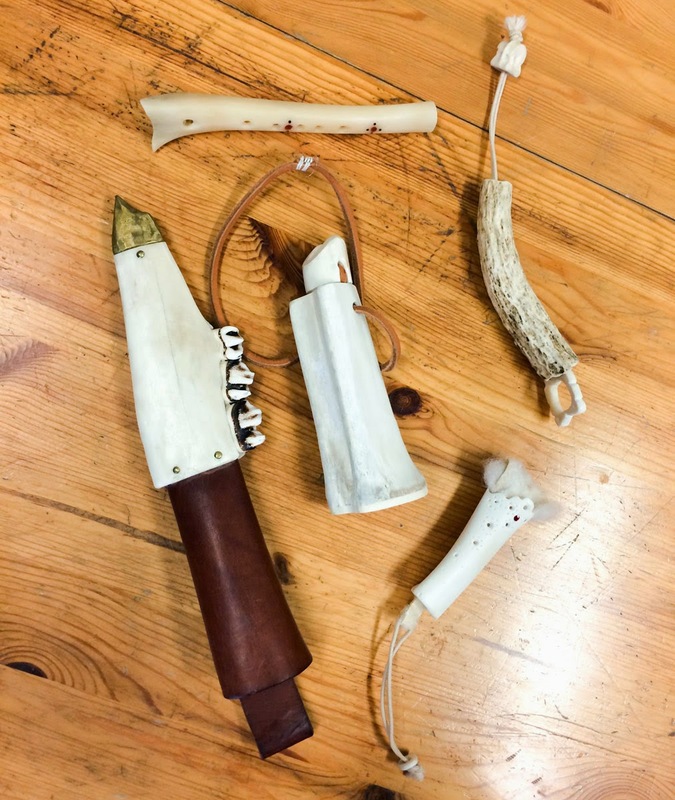 Jaime and I really loved bone carving class, and we spent the rest of class making a pile of amazing bone naalbinding needles that we will finish sanding and shaping at home. At the end of class we were covered with bone dust and happy. Craft camp was awesome! 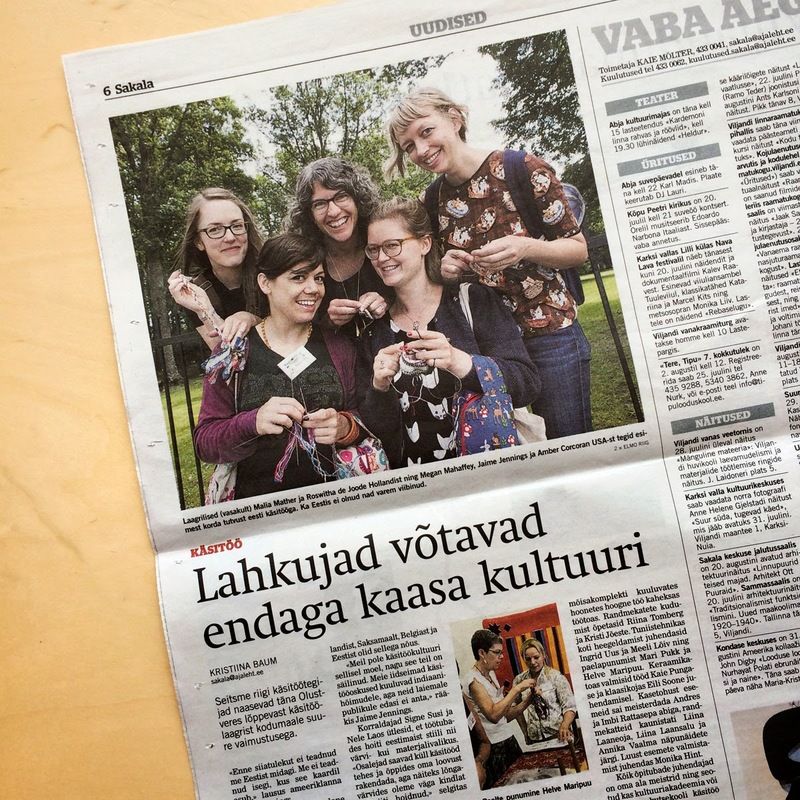 At the end of our week, some local reporters showed up to see our progress on learning traditional Estonian crafts. They were impressed at how far we had traveled to attend, and we made it into the local paper! We are now world-famous crafters! 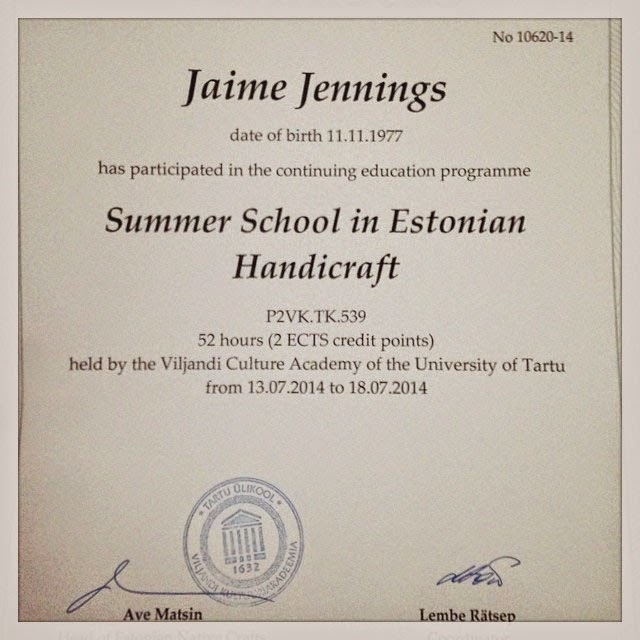 We also each received a certificate for our achievements in Estonian handicrafts. Its official: we ♥ Estonian Handicrafts! Check back tomorrow to see the final Estonia post--the results of the Sleep Season yarn knit-along that we and our travel companions, Jess, Alsn, and Megan, made while we were traveling together! What a great report on your Estonian Adventures! I always love to read about your travelings.